Jazz up any item in your home, or even outside it, by making everything you touch turn to gold. The application of gold leaf can be fiddly, but it's a technique that's worth a try and suits many techniques from shabby chic, to completely making-over a mirror frame. Most of the materials should be easy to find in a local craft or DIY store, or consult online stores for trickier finds. As the saying goes, "a bad workman always blames his tools," it makes sense to start with the right equipment to achieve successful gold leaf application. The gold leaf itself, along with the gilding cushion are available from specialist suppliers, as is the gilding knife. However if you have a straight edged knife like a butter knife, or straight-edged metal spatula this would also work well. 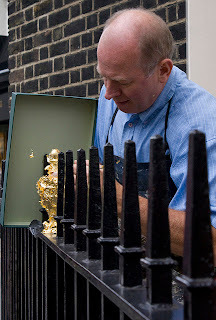 Gum arabic is used to make an adhesive when using the gold leaf technique, for application to a shiny surface like glass, whereas using shellac flakes mixed with a little methylated spirits makes an ideal adhesive for applying gold leaf to furniture, or a wooden picture frame for example. Degrease the gilder's cushion, by applying 1/2 teaspoon of pumice powder, using the gilder's knife. Scrape it over the surface using the edge - not the flat blade. Brush off the excess, and ensure your knife is free of powder. Gold leaf is supplied on paper sheets. It is easier to work with if you cut these sheets into strips, using a sharp craft knife. 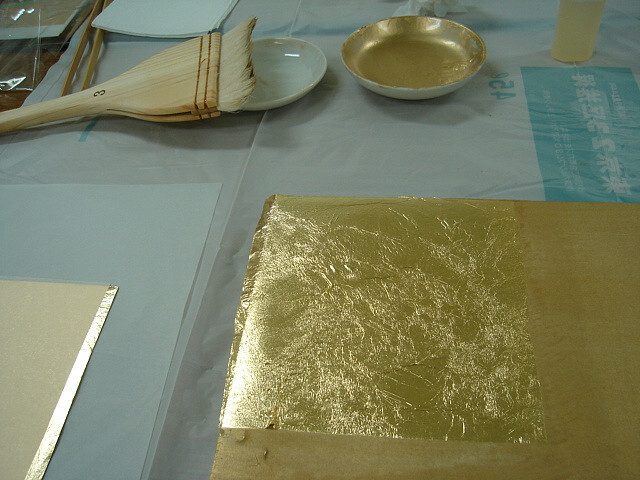 Lift the gold leaf from the backing sheet, using the knife, and put it on your cushion, making sure it is flat. Tip: Don't pull the leaf around to get rid of creases as it is very fragile, breathe closely to it to get it as flat as you can. Put a dab of Vaseline on the back of your hand and smear it around to create a thin film. Pat the cotton wool onto the back of your hand, and then dab it onto the gold leaf (it should stick to the cotton wool, because of the Vaseline). The gold leaf is now ready to be applied. Mix gum arabic with a little water to create an adhesive if you are working on glass, or mix 1oz (25g) shellac flakes with 3.5 fl oz (100ml) methylated spirits for working on porous surfaces like wood. Paint this adhesive onto the surface you are working on, and place a gold leaf strip over the adhesive carefully. Diva Tip: It is better to apply more adhesive than you will need, as the gold leaf will adhere better with fewer creases. It is also then easier to ease out any creases as the adhesive beneath will be slippery. It is fine to hold the gold leaf in place with the edge of your thumb or a soft brush, for a few seconds, to stop it slipping off the surface. When applying your next piece of gold leaf, try and allow a few millimeters overlap, on top of the previously adhered piece. Gold leaf is so thin; this will not show on the finished item. When the adhesive has dried, wipe over with a soft brush to remove any excess from the surface - especially if you are applying to an irregular surface (like the fence, pictured). If you want to create more interest to your gold leaf application, then add a pattern by scraping into the gold leaf with a sharp tool (those used for clay work and dentistry - try eBay - work particularly well). Or try this method in reverse, by painting on your adhesive in a particular pattern and applying the gold leaf over it. When the adhesive dries, the excess gold leaf can be brushed off, leaving the pattern behind. You could also try achieving a more shabby chic style effect to your project, with the addition of a crackle glaze, on top of the gold leaf. Once you've mastered the gold leaf application technique, you will be using your new found skill on almost any project you lay your hands on. You could even try drinking glasses - cheers!